Join us the first week of May for the 10th Annual Power Wagons in Moab. Whether your truck is stock or modified, there will be something for everyone. Take in the sights, make new friends and hit the trails to test your skills. Sleep Inn, Quality Suites are the closet hotels to the daily rally point with decent prices. Big Horn Lodge is one of cheapest hotels in town but is located more centrally in Moab. Ne sure to make reservations sooner than later. There will be a group camping at Yellow Circle Road: 38.426606, -109.420002 Straight boondocking. No hookups, no water, notta. Pack it in, pack it out. - Make sure your 4x4 is in good working order. - Good Set of AT or better tires on your vehicle. - Spare tire, full size mandatory. At least 1. - Duck Tape, because duh. There are LOTS of climbs. Trails are mixed; dirt and small rocks, Sand, Washboard roads etc... So be prepared. Don’t just count on someone else in the group being prepared. We didn't have comms last year, but this year it's a requirement. We are using comms to keep things organized on the trail. If you do not want to get GMRS license/hardware, you can use FRS walkies on these same channels, you can get these for ~$30 at Walmart or Amazon. The range will be limited but should be acceptable with the size of our group and the speeds we'll be traveling. I highly recommend that you at least bring a walky to use, it will improve everyone's experience. For those running Baofeng Handhelds, @aearles put together a small config with all of the relevant channels. You can use CHIRP to flash this image to your device. 1-3 FRS Primary, Secondary, and Backup. We will only change from primary if there is interference on the channel. If others are using our frequency it's best to just move to the next. 11-14 Common Ham Simplex Channels for monitoring. 13 is the assigned simplex frequency for Hams in our group. TX is disabled in the non-ham configuration. 21-25 Ham repeaters accessible in the area. TX is disabled on the non-ham configuration. 41-50 Weather channels, these are set to skip when scanning but are programmed in case you need to check weather forcast/conditions. Those of us with Ham Radio licenses will plan to use 146.400 for simplex. This will allow us to communicate over greater distances than FRS/GMRS and we can relay to those nearby as needed. There's good repeater details in the first post as well, this should be helpful for reaching town or other hams without cell service. If you're not licensed but are interested in improving your mobile communications, it's very easy to get licensed and has a lot of advantages. The test is very easy to pass, costs $0-$15 depending on the testing center, and licenses are issued within about one week. I can help you get started if you're interested, PM @aearles. Guide to Moab, UT Backroads & 4-Wheel-Drive Trails. We will make use of this book during the trip and it will help you identify whats ahead on the trails we do. FIRST AID: Bring any special meds you need. Bring some general comfort items and SPF 30+ sunscreen. First aid is essential traveling in the back country. Don't rely on others. Something as simple as an Adventure Medical Kit should suffice: http://amzn.to/2ifD12P and is good to have on hand in your vehicle anyways. BRING WATER, everyone should have 1-2 gallons of water per day, per person in your vehicle. It’s the desert, and it’s hot. Don’t be stupid. We are usually be on the trails for most of the whole day if not longer, so pack accordingly. Bring a cooler, bring snacks, sandwiches, whatever. Just reply that you are confirmed and I can add you. I want to gather our contact details so no one gets left out or missed when they arrive. Last edited by BoldAdventure on Sat Apr 29, 2017 12:22 pm, edited 32 times in total. If I wasn't in the 49th state I'd be there. It will probably be a couple years, but look for me to show up to one of these eventually! Same time works for me...I'm in! I'll be there. Those dates would work for me. I would like to make it for 2017! I want in so badly...if I'm not deployed by then or at training i'll be there. We'll do an official confirmation sign up in January, and I'll have an itinerary with something for everyone. Probably going to hit up Moab again myself this fall when it cools down a bit more, and do some more research. In my hometown I used to run the local Camaro & Firebird (F-body) club and have some experience organizing rallies and shows and such. So let's get excited about this! Let me know when in fall you plan on going might want to meet up. Yeah I got a week vacation the last week of October so if you go out around then I would make the drive there. I'm coming from central Iowa. End of October sounds like a good time for an exploratory trip. We'll be finishing up closing on a house in Sept. Could be a nice break from all the hustle of purchasing our first investment property. I might be interested in a Moab run the last week of October as well. I got it on my calendar!!!!!! I will make this trip in 2017!!!!! Count me in !!!!! I took off Oct 24-28th. We are actually planning to go to Glacier NP. However, it might just be too damn cold. In which case, we'll be in Moab that week instead. If we change plans, I'll post up. Subscribed! I am very interested but not sure if the dates work. I will watch the thread and as we get closer, I will jump in if I'm able. 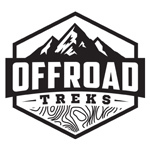 I also see the Overland Expo is the following weekend in Flag Staff (May 12th-14th). Man, if I could get two weeks off in a row! That's would be AWESOME! Wife and me are planning on going out next year. Years past. We stayed at one of the hotels in town. That's what we are planning for next year too. Wheeled during the day, and partied at night. Have a picture some where of Pitslave passed out, and curled up like a baby in Leif's condo. I would love to, but we are actually planning a 2-4 month open ended trip starting the week after Christmas :delicious: when we actually start working like normal people again, we are planning on a week trip to Colorado in June or August to do the Alpine Loop and a few other trails. Something closer to those times would be more reasonable to us. Mike Key had his Airstream,so,he and his family stayed at a campground. A couple of us were staying in hotels,and one couple slept in the bed of their truck under the stars. But we're back in town every night. Yea - I think hotel stay will be best. I was going to start working out details. A few guys who have been there might want to suggest hotels. I think an over night camp trip would be sweet, but with kiddo's it's tough. We'll probably bring the Airstream again and camp ourselves. What I want though, is an itinerary, and a rally point. I have a few easy gives, like we should most def have a group cookout, one big group breakfast and a group dinner out. Wheeling during the day, start easy, work way up. Hit up all the places/trails that are the most fun but also provide the best photo ops. As much as we all like to wheel, a place like Moab is a place you like sharing photos off. There will be something for everyone. We didn't do the White Rim Trail as a group last year, but it's really easy. I had a friend who wrote up this itinerary to get his "high fashion city wife" into it and he started with easy stuff and worked her into it over a couple of days. But I was thinking, maybe the White Rim Trail and a tailgate party would be a good introduction day. It's mostly dirt road with amazing views of Canyonlands driving along a Canyon Rim. We're mostly settled down in Boise, ID now in the new place and I'm getting more free time to start putting something together. Part of the reason I haven't been around the site for the past month is dealing with the move from Airstream life to sticks and bricks. What we used to do is on Saturday was the scenic trail ride, and Sunday was the tech trail ride. Both days, stop on the trail for a group lunch. Would meet in the morning for breakfast. Most times at Denny's. After the trail ride. Meet over at the condo's where some was staying and have a cook out. Bring your own meat, and share the veggies. How much does it cost to ship a truck from Ohio to Moab and back? I can't stand driving that long any more. Getting old. 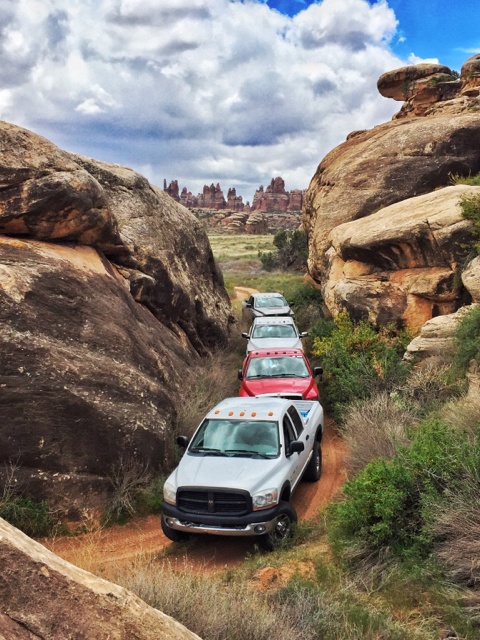 waldo wrote: How much does it cost to ship a truck from Ohio to Moab and back? You're halfway there...I drive from Boston,Mass. 32 hours each way,non stop.2 drivers. Pitslave came from Jersey by himself.